Born in Little Rock, Arkansas in 1978, Jeff Nichols is the writer and director behind such powerful movies as Take Shelter, Mud and Midnight Special. Nichols' first movie was going to be about mobsters in New York. However, his father questioned his plans and suggested he focus on a place and a time that he knew well. Nichols went back to the drawing board and came up with Shotgun Stories - a tense family drama set in the cotton fields and dusty back streets of Arkansas. Nichols had one actor in mind as he wrote the script for his first film - Micheal Shannon. He had seen Shannon in 8 Mile and knew that he was perfect for the role of Son Hayes. He tracked Shannon down and offered him the part. As a result, Shannon agreed to join the cast, reportedly working for free as money was so tight. Shotgun Stories was given a limited release in 2007, finding its audience thanks to widespread critical acclaim (Roger Ebert called it a “tense and sorrowful film where common sense struggles with blood lust”) and enthusiastic word-of-mouth. Nichols’ next film tackled a universal theme: (one that runs throughout his work) the need to protect the ones you love. He wrote the script for Take Shelter as he was starting his own family and used this experience to explore the anxieties of fatherhood - albeit with a menacing and melancholic sci fi edge. With a miniscule budget of just $900,000, Nichols managed to create Take Shelter’s impressive special effects. However, it is the performances that he draws out of his cast (Michael Shannon again in the central role alongside a brilliant Jessica Chastain) that give the film its emotional heft. Take Shelter was released in 2011 and won the Critics Week Prize at the Cannes Film Festival. The success of Take Shelter gave Nichols the confidence to approach Matthew McConaughey for the lead role in his next film, Mud. McConaughey agreed to star in this gorgeous coming of age tale, set on the Mississippi River. Mud was a career defining movie for Nichols. It was nominated for the 2012 Palme d’Or prize at Cannes and featured outstanding performances from its cast - both young and old. However, once again, the film’s distribution was limited and, despite rave reviews and awards, it had to fight to find its audience. According to Wired, Nichols’ struggle to get Mud in front of an audience prompted him to team up with a studio for his next movie: the superb Midnight Special. Tapping into our love of 1980s sci fi nostalgia (think ET, Close Encounters and Starman), Midnight Special tells the story of a young boy with special powers called Alton and his father’s desperate attempt to save him from the clutches of the government and a powerful religious sect. Midnight Special is a stunning film - it has powerful performances from Michael Shannon, Joel Edgerton, Kirsten Dunst and Adam Driver, it is visually stunning and it features a truly wonderful soundtrack. However, as with all of Nichols’ films, regardless of their budget, it is the human moments that linger. It is Son Hayes’ need to protect his brothers that hits home in Shotgun Stories, it is the image of Curtis cradling his daughter in Take Shelter that breaks your heart and it is Roy’s declaration, in Midnight Special, that he will always worry about Alton that moves you to tears. the story of an interracial couple who are sentenced to prison in Virginia in 1958 for the crime of getting married. 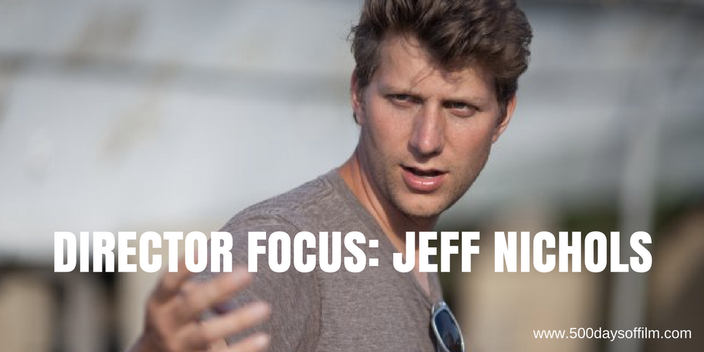 Jeff Nichols is a brilliant, exciting and innovative director and storyteller. He inspires loyalty in his cast and crew and, in four movies, hasn’t put a foot wrong. Do you admire the work of Jeff Nichols? If so, what is your favourite Jeff Nichols film? Let me know - you can leave me a comment in the box below!